We only have a few more clubs to go in our preseason look-ins. Now we’re getting in the home stretch with RSL today and hopefully closing out the rest of the week San Jose, Seattle and Toronto. Today we take a look in to see how the defending Major League Soccer champs are doing this winter. Jason Kreis and company have started to really get into building up a core group of players to work around. That was key to their late run and success last year in the playoffs. Now it becomes a question of do they have the depth to deal with a bigger and tougher schedule in 2010? They lost a few key players this winter like Clint Mathis to LA, Yura Movsisyan to Europe and Chris Seitz to the expansion club in Philadelphia. They did however pick a couple guys off waivers, which has been their bread and butter these last couple years along with drafting pretty well in January’s SuperDraft. Who they have: Nick Rimando, Kyle Reynish. Notes: We thought for years that the movement to Chris Seitz would finally happen in Salt Lake City, turns out that won’t take place now that he is gone to Philadelphia to show off his stuff. Thankfully though RSL still has trusty ol’ Nick Rimando. As long as he is healthy this club has little to worry about in this department. They are trying to figure out what to do in terms of a backup here. Reynish is an alright choice but not one RSL fans are use to seeing. They’ll probably look to sign a developmental guy for their 3rd keeper as well. Davis tells me they’ve had a couple keepers in camp but so far none appear to be signed by the club. Who they have: Tony Beltran, Robbie Russell, Jamison Olave, Nat Borchers, Chris Wingert, Rauwshan McKenzie, David Horst, Chris Schuler. Notes: A solid group but at time last year could be really shaky due to lack of discipline. I think depth wise they could use a little more with the amount of games they will be taking on late in the year. I do like the fact that they are a seasoned bunch, not too young and not too old to handle this upcoming busy schedule. Now I do wonder if they need more help on the outside of their backline. I think in the middle they’re set for now but something tells me they could wear down easy on the wings. I do expect Horst to stick around and get a roster spot but as for Schuler and McKenzie it may not happen at this point unless the rosters are some how expanded with a new CBA. Who they have: Andy Williams, Kyle Beckerman, Javier Morales, Alex Nimo, Jean Alexandre, Will Johnson, Ned Grabavoy, Collen Warner, Nelson González, Luis Gil, Raphael Cox. Notes: The success and failures of this team rest on this group. 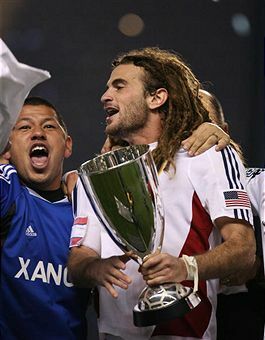 Beckerman is a beast that I’d take on any team but say he gets a callup somehow this summer to South Africa (long shot at best for him at this point), you will see an immediate dip in this club’s performance. He’s the work horse on the field. Same goes for Williams who is just a class act all together. Keep an eye on Warner, he has real potential to be a quality player in this league, possibly even a ROY candidate if he gets the proper playing time. I wouldn’t be shocked to see Cox be released once the roster compliance date is set. With the additions of Luis Gil in the last couple weeks it will put pressure on RSL to figure out what to do with Cox. I think this group has some quality to it but again a lot of pressure is on them. Morales needs to return to his quality form of 2008 and not go in and out like in 2009. If he has another down year so will this group. Johnson also needs a good season as well, he wasn’t as impressive to me in 2009 as he was when he first came to the club in 2008.
Who they have: Robbie Findley, Abe Thompson, Fabián Espíndola, Tino Nunez, Pablo Campos. Notes: Findley is the X-Factor for them. When he is on he is damn good but sometimes he goes a bit too cold for my liking. He came on strong when it counted late last year so we do know he has some fire in him which may also lead him to South Africa. He has to know he needs a strong start to the season to be in South Africa. If he does make it onto Bob Bradley’s team in June it will hit this club hard offensively. With the loss of Movsisyan I just don’t think they’ve done enough this winter to balance things out. I know they believe a lot more in Campos and Espindola than I do. I like those two but I’m not totally in love with the idea that they will be enough to carry this bunch offensively if Findley is gone for a while this summer. They did make an effort by trying to get some guys from South America, particularly a couple young strikers from Quilmes: Quique and Olivares. Bad luck would have it that neither are coming to RSL anytime soon. I think down the road they’ll need to add another part here to handle the heavier slate towards the end of the season. A lot is going to need to take place for RSL to repeat as MLS Champions in 2010. This team is good but let’s not forget for a minute that they were a sub-.500 team last year that got hot when it mattered. There are still plenty of holes to fill not to mention they have the added pressure of being the defending champions now. Another thing they must improve on quickly is their road performance. With only two wins during the regular season on the road last year it is still a mystery to some how they even did so well late. This team has talent and can win we know that but the inconsistent play has to stop if they want to repeat. The schedule won’t be too kind on them either, especially late in the year. But if Kreis can pull off another magical run this year it could be fun to watch.